First, I should declare that I am a Software Development Engineer for Amazon. 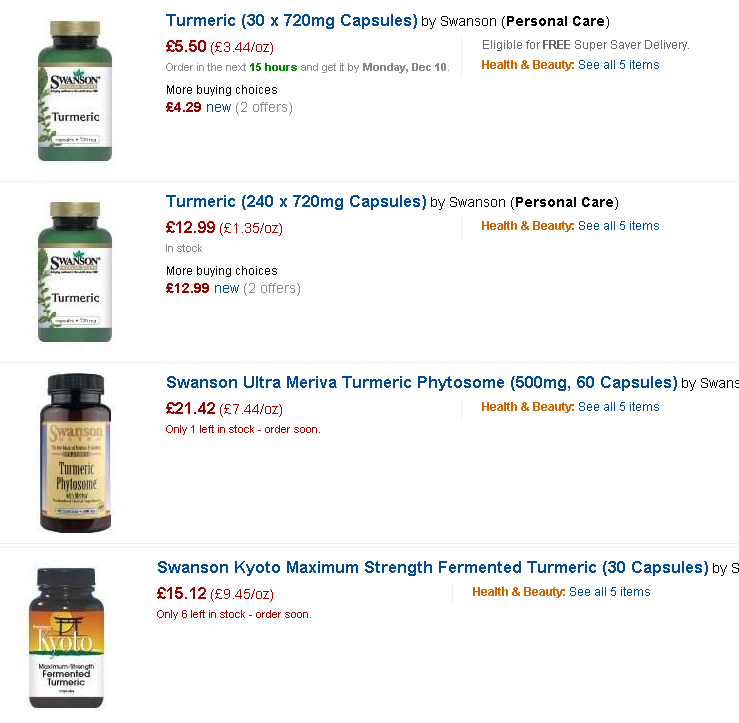 I was using Amazon for supplements before I took that job. Look at bulk for herbs and make your own capsules. The first thing is that the identical same item(but different quantity) was 2.5 times as expensive per pill (look at the first two above)!!! You then see “premium” versions that may be “technically better” (which often means just 5% better! ), going for a much higher price, up to SEVEN times more per oz. So, if someone told you that Gasoline ABC will give you 5% more mileage, you are willing to pay $28/gallon instead of $4/gallon???? This can be a problem with many MDs — they will recommend a specific brand because they have been told (often without any peer-reviewed study being done) it is “better”. They will rarely look at the cost, just the “better”. Better should be proven if the cost is 10+% more. A formal study, not just personal observations (which are very inclined towards placebo effects). So, we are now down to 1.35/oz. Can we reduce it more? Turmeric is a kitchen spice, so if you are willing to make your own capsules… just buy the powder (toss in 1% black pepper is recommended for Turmeric). If you are not needing organic, then we are down to 4.69 per kilo. Ok, we have per oz above and per Kilo here… 1 Kilo is 35 oz. so 4.69/35 = 0.13 /oz…. Bottom line: You could be spending 9.45/oz OR 0.13/oz. A SEVENTY FOLD (70x) difference… Ouch! In effect, capsules are between 1 and 2 cents each. 100 capsules are about $1.50 at retail (likely less than $0.50 for a manufacturer). 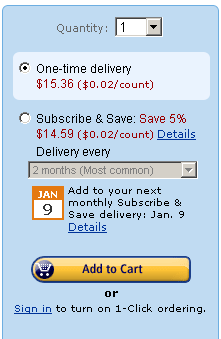 Amazon offers “Subscribe and Save” on items that it ships. They will gather all of your items into a single shipment each month. Before they send it, they will email you — you can opt to skip or cancel the shipment of any item. Our usual practice is to check the supplies when the email arrives, and cancel the shipment on any item where we have enough on hand to survive until the next cycle. What you get will make the budget go further: FREE SHIPPING and 5% more savings! The advantage to the brain fogged is that you do not run out! 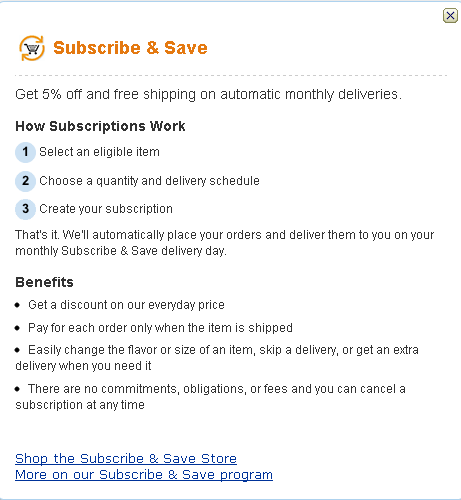 Remember, you can subscribe for just one shipment (getting free shipment and 5% off) and then cancel it with no hassles! Today,there are a lot more things, especially herbs that are available is bulk. 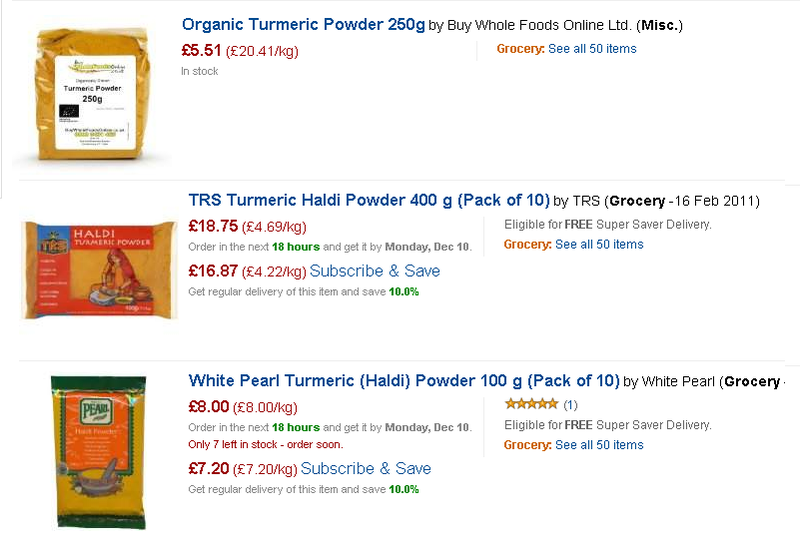 My bulk bin has: piracetam, turmeric, tulsi, haritaki as well as items such as L-Glutamine. 1 oz is 28 gm, so 16 oz is 450 gm. Sometimes, you discover that healthy is cheaper. A single loaf of organic bread will often run $5-$7. When I looked at FOS to help gut bacteria, I found that the best source was from rye (which is not used in FOS pills). I remember that I could buy 100% Rye bread made in Germany at some health food and delis; no GMO grains in it. Most US “Rye bread” contain wheat (sometimes more wheat than rye — these are 0% wheat breads!) I decided to check on Amazon… Feldkamp Whole Rye Bread , 16.75-Ounce Vacuum Packs (Pack of 12), for $29.00. That is $2.40 for a 17 oz loaf (half the cost per loaf as local bread). The loafs are vacuum pack and have a long shelf life (months). With Subscribe and Save (or with Prime), it is free delivery! If I ordered “Source Naturals FOS Fructooligosaccharides 1000mg, 200 Tablets”, it is $20.00, and an inferior FOS.